What is an Epidural and Should I Choose One? An epidural block is one of the most common forms of pain relief used in hospitals today for the laboring mom. Some moms choose this the instant they get into the hospital not wanting to feel any discomfort, and others wait and choose it if they feel they need it. Wherever you choose to give birth you should educate yourself on this form of pain relief as you will most definitely be offered it, if you give birth at the hospital. If the mother is having a normal labor and birth and is handling the pain well, then, in the majority of cases, the risk’s of the epidural outweigh the pro’s. However, sometimes there are circumstances when an epidural may want to be considered. When the mother is about to undergo a painful intervention, is exhausted and this exhaustion is causing complications itself, or when the mother is experiencing unusual amounts of pain and is no longer handling it well are just a few examples of when the epidural may be a feasible option. It’s important to consider both sides of the story when choosing whether an epidural is right for your baby. An epidural block is a regional analgesic that can be used during labor. The anesthesiologist will insert a needle into a small space in your lower back (known as the epidural space) and insert the required medication. It usually takes 20 minutes for the full effect to take place. * Most pain will probably be alleviated in the lower half of your body. * You’ll remain awake and alert. * Usually has no or little effect on the baby. * Can be combined with a spinal block to create the ‘walking epidural’ where you would be strong enough to walk and move during the contractions. * An epidural can help a woman’s mentally as she will be more likely able to rest and relax. This can help her dilate easier if she has been experiencing a lot of tension due to the pain. * One side of your body may be numbed more than the other. For approximately 10% of women the pain relief may be inadequate. * May decrease your blood pressure. * May slow baby’s heart rate and/or result in an abnormal heart rate pattern. This can result in a possible cesarean delivery due to fetal distress. * You may feel like you’re having a hard time breathing, if the effect is up in your chest. This is temporary. * You may need a catheter as it can make it difficult to urinate. The ability to empty your bladder during and after labor is very important. * You may get itchy and feverish, causing concern for the possibility of infection in you and the baby. This may result in antibiotics being administered to you and your baby. * Even during a walking epidural you may still have to remain in bed, depending on your individual circumstances. * After delivery some develop an intense headache known as a spinal headache. This can result in days of bed rest. This is rare. * The Epidural largely reduces the mothers natural release of oxytocin. This is important to note because when the baby is born the mother’s natural peak of the release of the ‘love hormone’ is suppressed. This suppression can damage the initial bonding that takes place between the mother and child. * At birth, the suppression of the mother’s natural hormones can result in the difficulty some women experience pushing out their babies, causing an increased risk of the use of an instrumental birth. This is commonly found among women who have received epidurals. * Due to the mother’s pelvic floor muscles becoming paralyzed, the risk for a posterior baby increases, thus increasing the chance for an instrumental birth or a cesarean. * It may slow down labor. It increases the need for pitocin as an epidural suppresses the mother’s ability to create her own oxytocin. * In first time moms it has shown an increase in their chances of cesarean birth by two or three times. * With an epidural comes IV fluids for the mother. This can cause your baby to weigh a little extra at birth (water weight) and then lose that weight quickly after birth through urination. With this comes the worry that your baby is losing too much weight after birth and therefore isn’t eating/gaining enough weight. As the baby’s weight at birth was probably inflated the weight loss also would probably be inflated. For some reason, our American culture is very scared of pain. I understand this as I am too! However, as mothers, we have a new human being that we must bring into consideration. 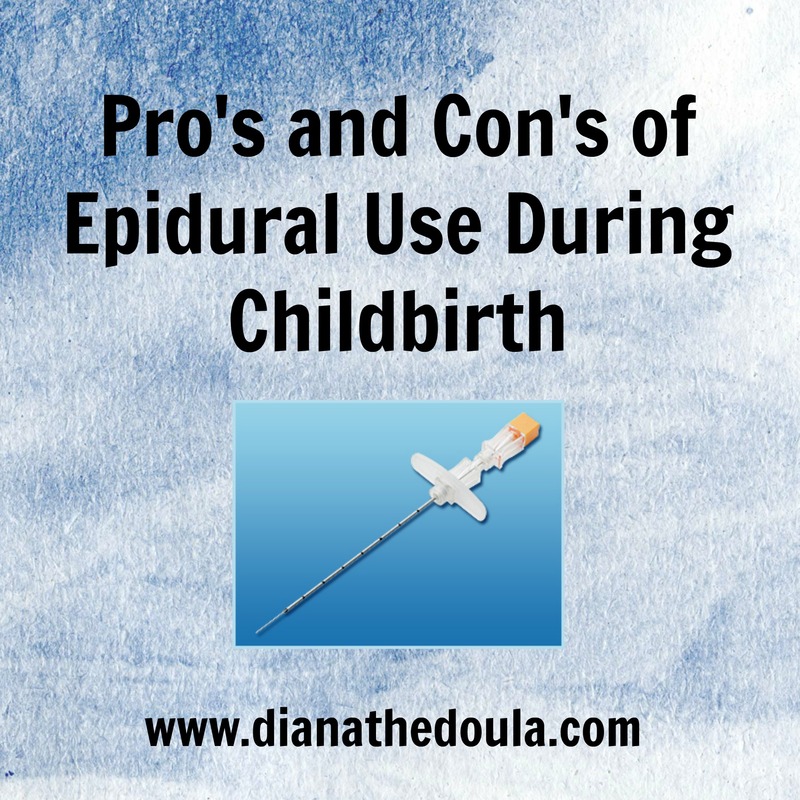 There are so many con’s involved with an epidural that it’s important to be educated before making your decision. Most of the women I’ve talked to that have had epidurals knew more about the pro’s than the con’s. Educate yourself now so you can make the best decision. Whatever the mother chooses to do regarding painkiller, it is important that she be able to give informed consent. Knowing both sides, the pro’s and con’s, of every decision will help the mother choose what is best for her baby and her situation. Mothers can take this information as well as their own individual situation (their fears, their support system, how they visualize their birth, etc.) and make an informed decision. Finally! The Baby is Asleep!! ← Why Your Baby Doesn’t Want a Nursery.